Let's face it – a lot of guys that are into tech, high-class smartphones included, are often not interested in hitting the gym or going out for a hike or run. Now, this is not due to negligence or unwillingness to look after themselves, rather – forgetfulness, lack of a habit to exercise daily, being daunted by what seems like an overwhelming process, a lot of diet information to take in, or any mixture of these. That's why many may find themselves scratching their heads as manufacturers pump out premium flagships with fitness tracking capabilities and niche wearables that measure and log heartbeat, steps, et cetera. But as we said – lack of will is not one of the prime issues here and thanks to the aforementioned new technologies and some imaginative app developers, even the most devout couch potato has the tools they need to start taking care of their body one simple step at a time, while, hopefully, changing their health lifestyle for the better. So, we present you seven great health apps that will hold your hand through some basic steps you should take if you decide that you need to get in better shape, or at least feed / hydrate yourself better. Every health, wellness, and fitness instructor will stress that it all starts with being properly hydrated. Let's be honest – most of us start the day with one or two cups of coffee, and possibly a glass of orange juice (which hardly has any orange in it) with our breakfast, then have one or two sodas throughout the day, and then we jump to beer / wine / liquors in the evening. If the only water that gets in your body is the one you use to rinse after you brush your teeth, you may need to start using this (or one of the many similar ones) app ASAP. It will basically tell you how much water you must drink per day, calculated based on your height and weight. Then, it will remind you of your goal each hour (or whatever time you set). Been thinking about adding some healthy foods to your diets, but don't know how to go about this? Well, there are plenty of health food listing apps in the Play Store, and we happened to like this one. It looks nice and it allows us to enter our own interests, so it could better suggest recipes we might be interested in. So, if you've no idea where to start – you might as well grab this app and see where it takes you! Have no idea whether your Body Mass Index (BMI), Waist-to-Height ratio (WtHR), or boy fat percentages are in norms? This app will help you calculate them and will provide useful info on whether you should be concerned or not. It's a great first step to take before choosing what type of exercise or diet you wish to add to your life. Based on a scientifically chosen set of 12 exercises that are done for 30 seconds each, with only 10 seconds of rest time between them, these two apps are probably among the best of many clones that we've found in the Play Store. “Seven” has 8 alternate workout programs for different parts of the body, which you can unlock by either sticking to your daily routine or paying for them. It will also turn the process into a game, by giving you 3 “lives” – you lose one each time you skip a workout – and by giving you achievements. 7 Minute Workout only has 1 alternate program (Abs) and 1 that is currently under development – both can be earned or paid for, just like with “Seven”. Its plus is that it supports Google Fit. Zombies, run! 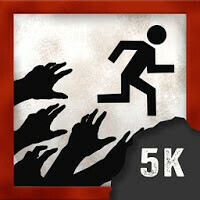 is an audio game for joggers – it stimulates you to run and eliminates boredom by walking you through a zombie apocalypse story and letting you know when you are in “danger” and should pick up the pace or when you can rest. Zombies, run! 5K training is a toned-down version strictly built to help novice runners build their stamina up so that they can achieve their first 5 kilometer run. Might be just what you need to start jogging? So, you've decided to lose / gain weight, but it seems that you are not progressing towards your goal at all? Fear not, us humans tend to get frustrated when we don't see signs of improvement within the first week of undertaking a new project – it's just how we are wired. For longer-term goals, it's a good idea to track your progress, so that you can clearly see where you were when you started and where you are now. Out of the many weight tracker apps on the Play Store, we found this one to be a great looker and to do its job as it must. So, check it out! Not a personal wellness app per se, we still find this to be a must-have on a smartphone. We've all sat through at least a couple of First Aid courses in our lives, but mundane everyday life will most often than not wipe any knowledge we've accumulated in said courses away. So, what better thing to have than a Red Cross app on your phone, which will allow you to quickly browse categories and refresh your memory on how certain situations are dealth with? It includes both first aid tips as well as guides on how to prepare for various types of disaster and has a location-based hospital finder. And how the weight tracker assistant track your weight you stand on your phone!?!? Sry I know it's stupid but how the app is accurate or useful if not. As usual, nothing for serious weight lifters... like exercises and instructions on proper form! On symbian I had Barbell Gym Tracker, but still haven't found anything better on android...which is weird!!!! lol that's really funny even though I lift 6 days a week.